5 things every barbering student needs to know to succeed. Expert barber and TMG College Australia trainer, Mario Fallace, talks about the five most common mistakes his students make and how to avoid them. The artisanal nature of barbering has attracted a new generation of students to the industry. 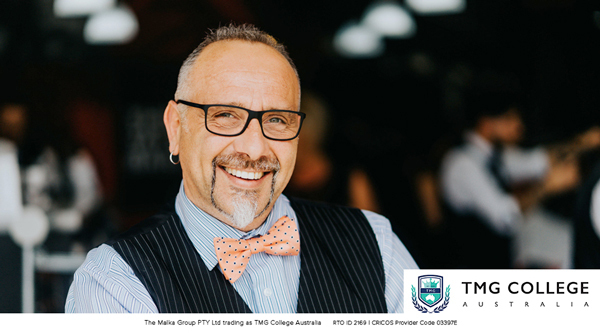 TMG College Australia is at the forefront of barber training, with our superstar barbering trainers leading the charge. Master barber and TMG College Australia trainer, Mario Fallace, talks about the five most common mistakes students make learning the craft. Mistake 1: Students don’t want to learn basic female hair design. Mario says: Female hair design is imperative for long men’s haircuts. A barber must be able to provide a long hair service to male clients. To build a foundation, I teach my students core ladies hair design and cutting from the beginning. Mistake 2: Students don’t understand that colour will be/is a part of the modern day barbershop. Mario says: I make sure my students know the importance and basics of colour theory and application. Mistake 3: Students think barbering is all about the clippering skills. Mario says: Early on, I instruct my students in the use of scissor skills. Scissor skills are just as important as clipper skills. Mistake 4: Students expect the all the skills to come at once. Mario says: It starts with mastering the core mechanical movements. Students need this as a foundation before they can move on to efficiently using more detailed skills. I give my students steps to follow and master before they start more advanced techniques. Mistake 5: Students become impatient and frustrated while learning. Mario says: I try to instill in my students a sense and attitude of patience to teach them that barbering is a journey and they need to start the path from the beginning. Enrol now in TMG College Australia SHB30516 Certificate 3 in Barbering so you can kickstart your career. Call 1300 888 864 or visit tmg.edu.au for more information.